Just in case you have been living in a remote cave, we are here to remind you that we are in the midst of mega-important-sports-time. Baseball is reaching the height of the season as playoffs and championships are popping up all over. And now the almighty football season is in full swing, in a contest between action on the field and drama off the field to see which gets more interest! All of this demands a great deal of screen time and even if you don't have an official man cave at your house, this would be a great quilt to toss around the TV room. Guys don't always appreciate the subtle nuances of the detail we often like to put into our quilts, so we have used a straightforward and favorite pattern, the Texas Two Step by Atkinson Designs. And no, we are not done with Tula Pink blocks yet! Kristina continues in her scrappy ways and we have 8 more blocks to share. 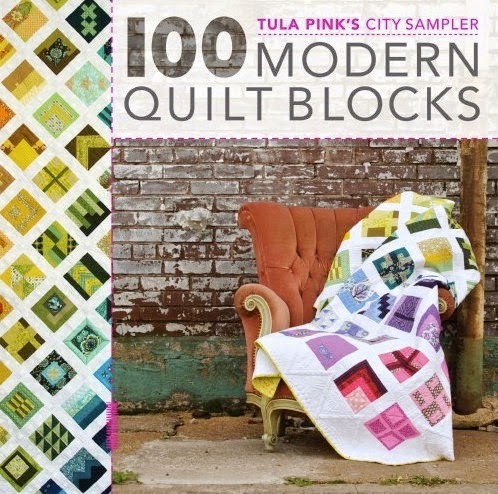 Remember, these are all in the City Sampler book of 100 Modern Quilt blocks. Do you need your own book? We can help you with that!